Few desserts are as comforting as freshly baked apple pie. Apple pies freeze well, which means you can enjoy a slice of a previous season's fruit pie well past the end of the harvest. Don't hesitate to make an extra pie or two to keep on hand for an easy-and-fast dessert at a later time. 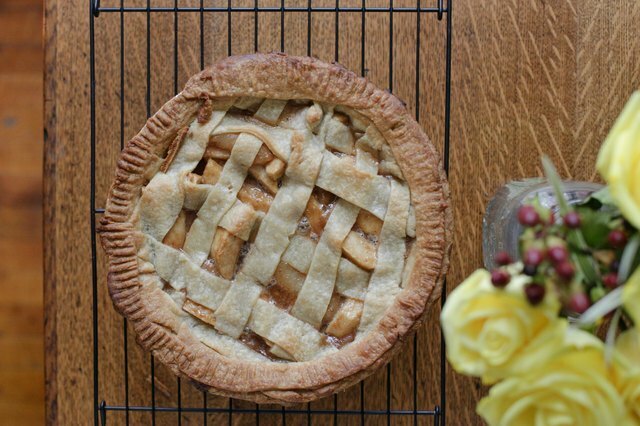 Learn some hints and tips for freezing apple pies, both homemade or made with store-bought pastry. Bake the pie according to your recipe's instructions. Remove it from the oven and allow it plenty of time to cool thoroughly. If an apple pie is still warm, even in its center, when you wrap it in foil, it will sweat inside the layers of wrapping and become soggy. Allow a full 8 hours for the pie to completely cool. After you place it in the freezer, it requires an entire 24 hours to freeze all the way through. When freezing and reheating baked fruit pies, time is a key factor in successfully recreating that warm, juicy, fresh flavor. Whether the apple pie is baked or unbaked, you should first wrap it in a double layer of freezer-friendly aluminum foil. Another option is to wrap the pie in plastic wrap and then place it inside a self-sealing bag. Using this option ensures the pie won't become freezer burned if it's kept longer in the freezer. A frozen fruit pie keeps for six months. 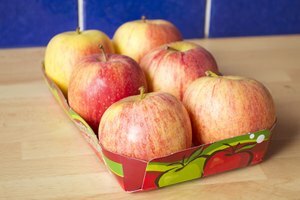 Though it's still safe to eat after that six-month period, the fruit won't taste as fresh when reheated or baked. When you're ready to reheat the baked apple pie, take it out of the freezer and unwrap it. Allow the pie to thaw for a full 3 hours at room temperature. Preheat the oven to 425 degrees Fahrenheit and bake it for 15 minutes. 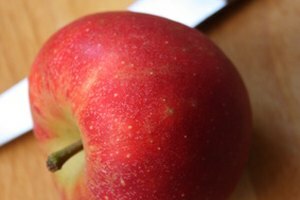 The higher temperature and short amount of time will help the pastry get crisp again without over-baking the apples. Your pie will taste as fresh as the day you made it. 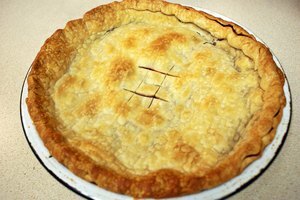 Before you decide to freeze a baked or unbaked apple pie, consider a few factors in the freezing process. First and foremost, a frozen unbaked apple pie will have a better texture and overall consistency than a pie that's been previously baked. When apples bake, they release steam and form a syrup inside the pastry. This means the pastry can get soggy and might not be as crisp if frozen after it's cooked. Another reason to freeze a pie unbaked: time. A frozen unbaked apple pie doesn't have to thaw before it goes into the oven. As long you preheat the oven, you can put the frozen pie straight on the oven's middle rack. Bake the frozen pie at 425 degrees F for 15 minutes; then lower the temperature to 350 degrees and continue to bake it for another 15 minutes. This allows the pastry to get crisp and toasty before the lower temperature lets the apples bake and steam. If you're freezing apple pie leftovers, don't worry. Although it may require a little more work and time, a previously baked frozen apple pie can be resurrected to taste just as good as when fresh.